Studio Blog: The latest gaming Buzz! Its here! The game that turns your living room into a game show! 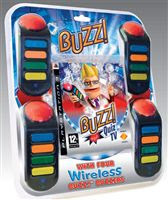 This is the first of the Buzz games that has been released for the Playstation 3. The game uses the PLAYSTATION Network to offer you the chance to quiz against people around the world, and even write your own quizzes. The game comes with 5,000 questions on the disc and the option of downloading thousands more. The questions are split into topics called channels. There are five channels: The Sports Channel, The Movies Channel, The Music Channel, The Lifestyle Channel and The Knowledge Channel. This means you can play the full quiz on a single channel or play in channel hopper mode and take questions from multiple channels. Buzz! Quiz TV available now at Studio.